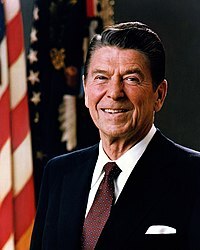 Ronald Wilson Reagan (February 6, 1911 – June 5, 2004) was an American actor and politician, who became 33rd Governor of California and 40th President of the United States. He was also the husband of Jane Wyman (1940–1948) and Nancy Reagan (married in 1952). Simple: People will never see how important they are until they see the importance of other people. Simple: People cannot destroy the dignity of unborn babies without destroying the dignity of all people. What it means: Reagan is talking about abortion. He is saying that abortion kills valuable human life. "If adults want to take such chances [with marijuana] that is their business." Simple: If people want to use marijuana then let them. ↑ Ronald Reagan on Abortion, National Review Online. ↑ Reagan's essay on abortion key legacy to pro-life, Baptist Press. ↑ Reagan, Ronald; Kiron K. Skinner, Martin Anderson, George P. (FRW) Shultz (2001). Reagan, in His Own Hand. Simon and Schuster, Page 395. ISBN 0743219384. This page was last edited on 8 December 2009, at 05:20.